Shutterfly offers customers the ability to upload, share, store, and edit digital photos through its Web site. 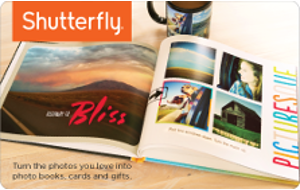 In addition to traditional 4-inch by 6-inch prints, Shutterfly offers prints ranging from wallet-sized to jumbo enlargements, and personalized items including mugs, photo books, calendars, magnets, and T-shirts. This card may not be exchanged for cash, and cannot be transferred. Use of this card constitutes acceptance of Shutterfly terms and conditions, which Shutterfly may change from time to time without notice.